In his national bestseller The Roaring 2000s, Harry S. Dent, Jr. forecast a booming market that he says will continue to rise through the first eight years of the twenty-first century. Dent's many predictions in that book, from unprecedented Dow Jones highs to corrections throughout the year, were consistently correct with an uncanny accuracy. In The Roaring 2000s Investor, Dent provides precisely the information people will need to get them the life they want -- for the rest of their years. 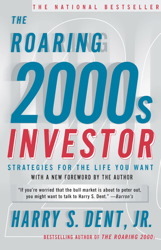 While The Roaring 2000s highlighted Dent's theories about the forthcoming economic future, this new audiobook zeroes in on specific strategies aimed at getting you there. Whether you are planning to retire in ten years or forty years, whether you are looking for a larger home or a smaller home, whether you are planning to put several children through college or planning for life after the graduates leave college, you will need a financial plan to guide you through the great boom of the next decade -- and the hard times that Dent theorizes will follow. Dent takes into account many realistic and different forecasts for inflation, college and retirement costs, insurance needs, real estate investment costs, taxes and tax-deferral opportunities, and offers a unique approach to building a diversified portfolio for the emerging new economy. The ultimate goal of The Roaring 2000s Investor is to have investors get personalized and effective financial planning that fits their specific needs and allows them to achieve their highest life goals. According to Dent, typical investors have not reaped the great benefits of this bull market because they have not been taught the most important principles of systematic investing. As Harry Dent's observations and predictions continue to hit the mark, investors will gain great rewards, making The Roaring 2000s Investor an invaluable commodity.